Learning music should be fun to do but there are processes along the way that can seem like an uphill struggle, especially to a young beginner. If these are persevered though, a student will gain more freedom at the instrument and, therefore, more fun and a greater ability to express him or herself, which is why they come to the piano in the first place. After a number of years teaching it has been very apparent just how fundamental parental support is to the development of a student's progress, not just with regards how far that student will go, but even whether they will get off the starting block or not. These notes are offered to parents so that they can harness their child's enthusiasm for music, encouraging positive progress to emerge as a result of curiosity and fun. Then, the home sessions and the learning process itself becomes creative and expressive and a young student's goal to be able to play the piano is achieved a lot quicker than thoughtless time spent 'going through the motions'. I try not to use the word practice. A couple of the many dictionary definitions are 'habitual performance', and 'repeated or systematic exercise'. You cannot do either unless you KNOW what it is you are doing! So a session at the piano is about LEARNING until such a time when KNOWING is reached. Then follows playing, and perfecting, both with a curious and enquiring mind. At no time do I advocate unmindful repeated 'drilling'. All time spent at the piano should have attention and concentration so as to incur clarity of the text and freedom of muscles. (See my article on Piano Playing and the Alexander Technique). Unmindful practice doesn't make perfect, unless you can include perfect mistakes and a perfectly awful technique! Engaging absorbing and attentive study at the piano makes perfect, takes a lot less time, and is a darn sight more interesting along the way! It may seem obvious to suggest that a parent facilitates its child's learning but it doesn't always happen, and it is vital that with so many after school activities the student is assisted in finding a regular time to fit their piano playing into their schedule. On top of this, as a solo instrument, playing at home can sometimes feel lonely and isolating for a very young learner, so having the encouragement and close proximity of a parent can be a positive support to their experience. The time at home is also the time when technical habits are learned and ingrained, so having an extra eye and ear keeps things on track. 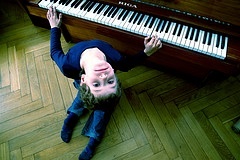 Parental support doesn't have to make learning the piano seem like hard work. On the contrary, it can add a fun and interactive element to what can sometimes be a struggle in the early stages when there is so much new material to absorb and digest. Having a parent help schedule the time, and gently discipline the child to keep to this schedule, can be an enormous benefit when there are so many other distractions. Music is an expressive and communicative art so a student needs to feel comfortable with themselves, and allowing them an inquisitive mind and lively ear, and the freedom to translate their expressions to sounds, is vital in their growth as musicians. It is challenging but necessary to encourage them without judgement so that they feel free to explore the colours and sounds of the instrument without feeling censored, but are guided in areas where there is a 'right' or 'wrong' (ie note). Finally, I'm a great fan of rewards, but when extra motivation is needed make sure the rewards are for trying rather than for getting it 'right'. Sometimes the road to getting things right is rather long so boosts along the way can give us the encouragement we need to continue to the end. This depends on the age of the child, their stage in learning, their own enthusiasm, their concentration span, and the quality of the time spent at the piano. In the very early stages when the fundamentals are being absorbed, as long as there is an understanding of what is being learnt, then little and often is probably best. As things become more complex then a little more time is needed to reach a mental understanding of what is being learnt, and a correspondingly increasing amount of time is needed to physically absorb it into the fingers. I am of the mind that it is important to have days off built into a schedule so there are guilt free non-piano days, rather than schedule practice every day and then 'not get around to it', but at the same time I know for some students it works to have it so ingrained into their routine, like cleaning their teeth, that they come to the piano without question and just get down to their work. It works differently for different families so decide what is right for your and your child. See above. The same constraints apply with regards age, standard, level of concentration etc. It will be different with each student. In any case though, allow for periods of 'fiddling' and games on top of the homework that a teacher sets, either within the practice session, or maybe in a second daily session. For instance, covering the set practice in the morning then leaving the pupil to do whatever takes their fancy in the evening - improvising, games, messing about finding tunes etc. Ideally when new technical habits are being formed then even the fiddling should be mindful, otherwise the good work undertaken in the set time gets undone as old habits take over when concentration is elsewhere. However, paramount is an enthusiasm and curiosity for the music and instrument so it's up to a parents' judgement how much to intervene when a student is absorbed in his or her own world at the piano. I have a number of games that I've developed that assist in note finding on the piano, note learning on the stave, listening, imagining, memory and other areas of what we need to cover. I've mentioned some of them on the resource page - feel free to use them when appropriate! And by all means get brothers and sisters involved. I have had the fortune to be taught by one of the top Alexander Technique teachers in the country, who is also a renowned concert pianist. She has spent 40 years looking at piano playing in the light of the philosophy and attitudes of F M Alexander and it provides the most remarkable approach to the piano, developing a deep sense of logic and clarity, freedom and mindfulness. Technically it is often about what we don't do rather than what we do do. Someone described it as the 'Zen' of piano playing! This is a good description. A piano key weighs about 2oz yet the strain that many pianists place on their whole body just to depress this weight is enormous! All that is needed is a release of energy, from the fingertip, directly down into the key. If a student is sitting straight then no muscles are used in holding the back up as the vertebrae are balanced, and the arms can be supported from the solidity of the back rather than the tension of the biceps or triceps. The body isn't made to sit in any position, but just allowed to find this natural supported posture. The action of depressing the key is a tiny but precise and sensitive release of energy through just the fingertip. The rest of the hand is loose and unstrained and the finger depressing the key returns to this unstrained group of muscles within a split second of playing the note. It is very similar to switching an electric light switch of the rocker type. A teacher will have given excercises during a lesson to help develop this. Certainly I do. You should be able to ask as often as you like for demonstrations. As it is about developing habits, short very focussed bursts at this is better than long protracted sessions with concentration slipping. Thumbs are a problem for pianists and are where a lot of the tension in technique is created. The impetus for the movement comes right from the tip. None of the muscles should need to be used and if you feel the fleshy pad of muscle at the base of the thumb it should remain squashy during the action. Again, there are excercises for the thumb that will help develop the freedom it needs. Learning the notes on the piano. There are any number of 'games' one can play to learn and then test for knowing where the keys are and finding them quickly. Spelling words, hopping up all the, for instance, 'Fs', finding notes with eyes shut, running to the other end of the room and back straight to a named key. I would like to say here that I don't especially like (and don't use myself) the mnemonics (Every Good Boy Deserves Fruit...etc) as by the time you have remembered which sentence goes with which stave and whether it applies to the lines or spaces, you may as well just learn the note! It seems more to learn rather than less. I teach one note at a time, and when there is a lapse I prefer the idea of landmark notes from which others can be worked out, or directional observation of how the notes are moving on the stave. Useful tools and games for reinforcing the position of notes on the stave are flash cards; writing own compositions (4 bars or so) each time a note is learnt, using the notes thus learned so far (if written in a book this could be a wonderful diary of progress and creativity); sight-reading; writing a story around words that we can find on the piano and writing these words on manuscript paper. Sightreading and note reading should be an ongoing and important part of daily piano playing, and recognising the feel and sound of rhythm and note patterns on the music is a vital part of this. Games that include naming notes, naming and finding notes, sightreading short pieces, finding the skips and steps/broken chord patterns/scale patterns in the music, clapping rhythms, writing rhythms that you clap (one bar in length) and clapping short rhythm patterns, singing notes in step and skip and scale and chord patterns and then guessing which you are playing, will all help with internalising what they see so that they can translate it from the written page to the piano. The strategy to learn a piece becomes more complex as a student develops and the pieces become accordingly more complex. Basically it needs a lot of focus, mental and physical, on small sections, so that intellectually and physically a student is clear about what he or she is doing. It sounds hard work, but actually takes much less time and the result is much more satisfying than merely muddling through a whole piece from beginning to end in confusion until, by some miracle, right notes manage to just about get in the right order. This results in a rendering that is at best hopeful and at worst falls into a complete muddle and at no point is it learnt. Learning is an interactive process and playing through pieces on automatic pilot doesn't engage the brain so it isn't active, let alone interactive. The amount of time wasted at the piano in the name of learning is immense and I think it is worth mentioning that a little more effort and concentration reaps more than a corresponding amount of reward and progress in less time! I have a huge variety of 'games' (practice/learning aids) and have listed in the 'Resources for Parents' page some which cover development of early note learning/ the stave/listening/memory. Games based specifically around the pieces being learned are on the cards in the centre pages of 'Improve Your Practice' by Paul Harris and add much to the engagement of a student in their learning of a piece. A theoretical knowledge of music, harmony, and history is necessary to compound a student's learning. There are some wonderful puzzle books for early stages of theory (and doing the compositions as mentioned earlier will cover a lot of theoretical knowledge). It helps a teacher hugely if 10 mins once or twice a week could be spent at home doing this as otherwise it takes a large chunk of the lesson. 'Improve your Practice' also has questions that a student answers about the specific pieces he or she is learning and utilizing this will assist in a pupil's all round musicianship. Other things you can do to support your child's musical life is to play a wide variety of music around the house, attend concerts (there are lots of concerts aimed specifically at children where they can play the instruments etc), check out the internet for interesting bits of information about composers they are studying or listen to fragments of other pieces by the same composer. Write stories or draw pictures while listening to (any) music. Listen to tapes of stories of the great composers.